Spring comes early to sunny Mesa, Arizona, with a colourful transformation that’s guaranteed to shift perceptions about the desert. By March, dozens of kilometres of hiking and biking trails in Mesa and the surrounding Sonoran Desert are already framed by vibrant patches of red, orange and yellow. Birds and wildlife flourish as the desert seems to come alive. Wildflowers start blooming first, then cacti take up the seasonal change, each species sprouting brilliant blossoms in turn over several months. No wonder spring is a favourite time to hit the trails. As we made our way up the serpentine Wind Cave Trail at Usery Mountain Regional Park on a clear April morning, we were amazed to see the arms on dozens of towering saguaro cacti crowned in creamy white blooms with yellow centers. 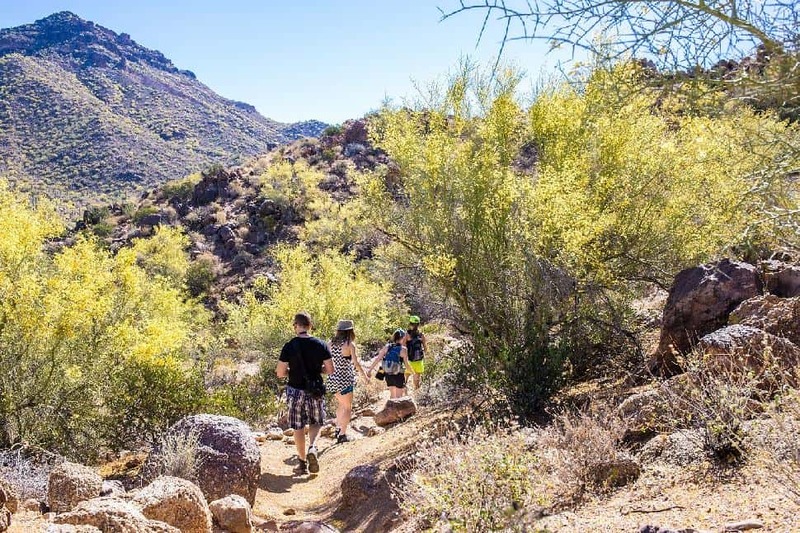 We found plenty to do in Usery Mountain Regional Park, located adjacent to the Tonto National Forest at the western end of the Goldfield Mountains. With more than 3,500 acres to explore, it also has activities for pint-sized adventure-seekers and families. Check out the Little Desert Explorers program for scorpion hunts, a kid-friendly hike, stargazing events and Creature Theater movie nights. 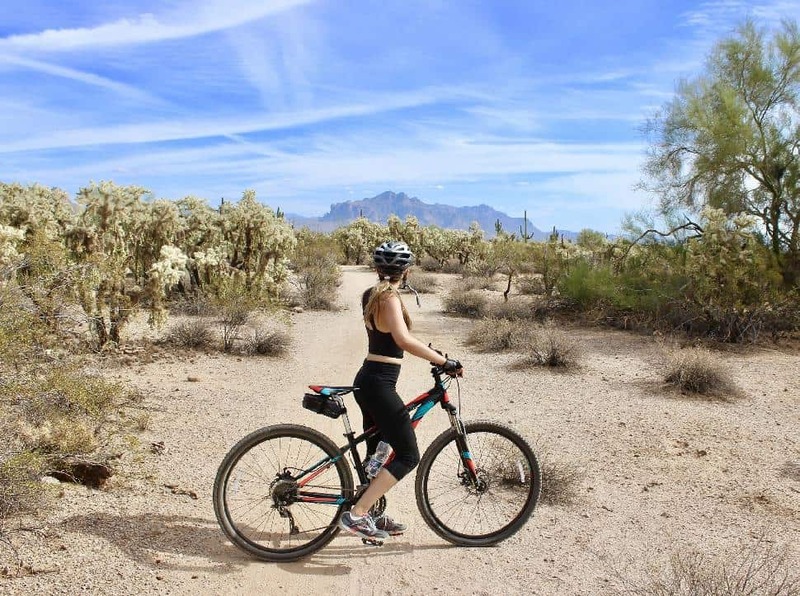 Mountain bike enthusiasts will find epic adventure along the park’s switchbacks and climbs, or check out the trails at local favorites Hawes Loop and in the San Tan Mountain Regional Park, which also has trails for hiking and horseback riding. Want more of a challenge? 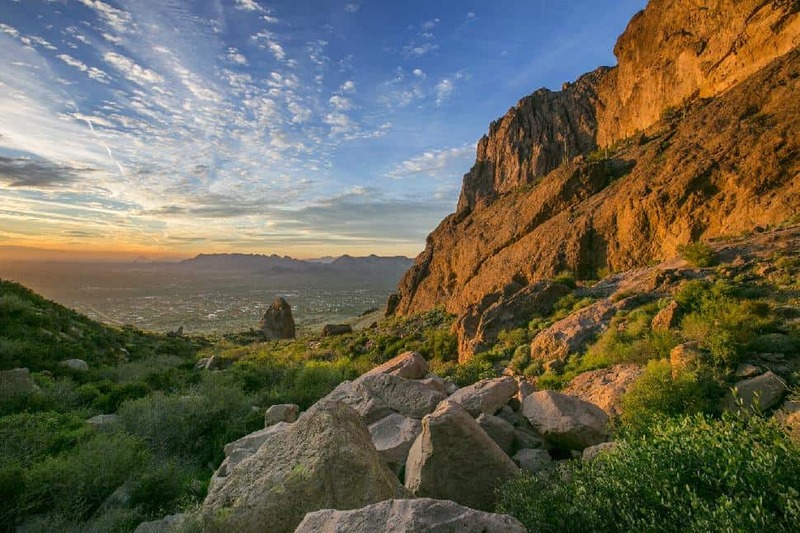 While Lost Dutchman State Park has trails to suit various levels of hikers in the Superstition Wilderness, the Siphon Draw Trail is a popular choice for those who want a serious climb. The reward for reaching the top of the Flatiron is a spectacular view. Sharp-eyed walkers, hikers and cyclists can spot bighorn sheep, deer, and the wild boar-like javelina. But truly, thanks to hundreds of species of birds that call on this area, the entire region is a birders’ paradise. The Desert Hawk Trail in Usery Mountain Regional Park is lined with feeders to attract some of the more than 500 species seen in southeastern Arizona, while the 600-acre Rio Salado Habitat Restoration Area in the historic Salt River corridor is a prime birding location along, accessible along easy trails and paths with interactive exhibits. Or drop in at a monthly Birds n’ Beer “educational happy hour,” to try a craft beer from Arizona Wilderness Brewing Co. and hear a talk about birds, wildlife, or conservation. Also located in the Tonto National Forest along the lower Salt River basin and on a popular bird migration route, the Granite Reef recreation areas offer plenty to keep birders happy with its diverse ecosystem. 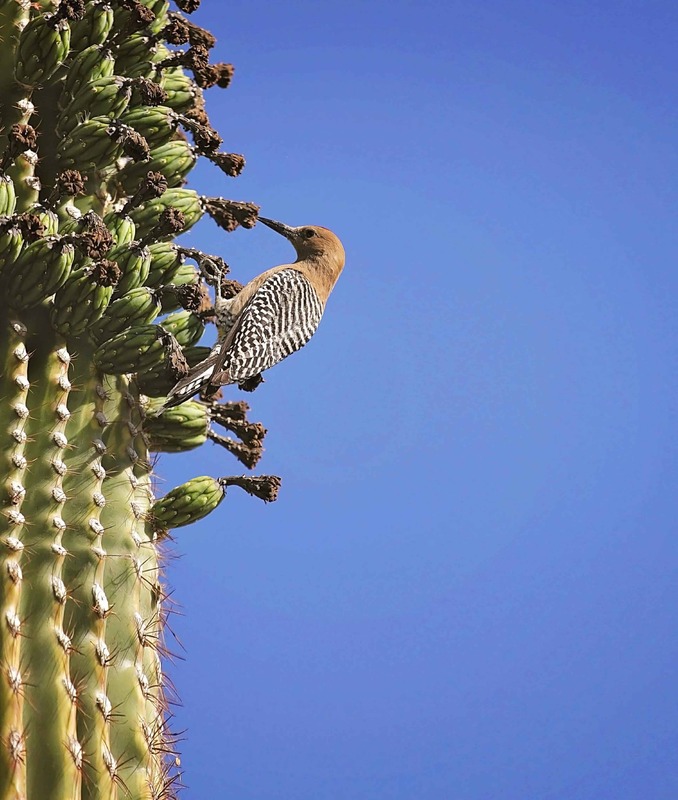 Set on 320 acres, Boyce Thompson Arboretum State Park has an impressive collection of desert plants, which form a habitat for hundreds of species of lower Sonoran birds. The main trail winds through a variety of areas and views, including the stunning Queen Creek Canyon. 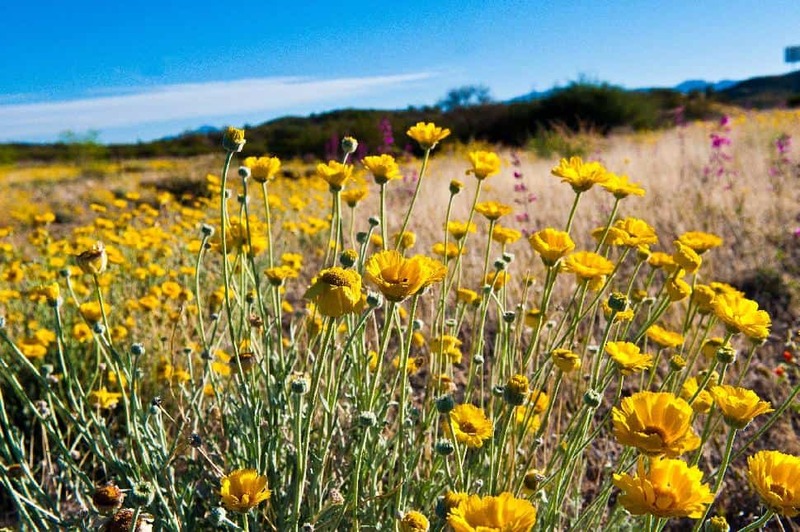 Desert blooms usually peak in mid-March but can start as early as February. Ocotillo blossoms: March through late May. Hedgehog blooms: vary; appear in late March or as late as mid-April. Blooms last only two or so weeks. Prickly pear cacti: early April continuing through late May. Saguaro cacti: displays its creamy white blooms (usually) by the middle of May. Peaks in late May to early June. Cholla: begin in mid-May and last until late August. 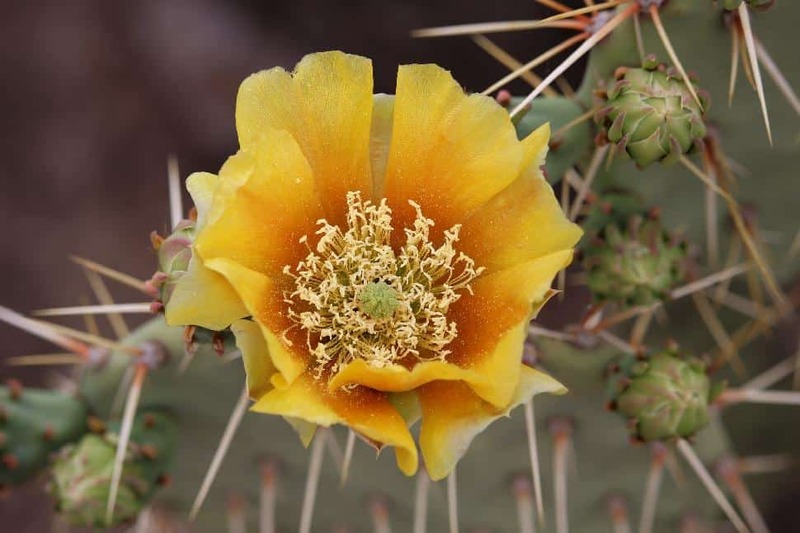 Barrel cacti: blooms are prompted by summer rains; appear in mid-June and peak in late August. Camping - sleep the desert: search desert campgrounds here. Glamping - prefer the desert with a mid-century twist? Schnepf Farms now offers Airstream glamping. Sleep centrally - search urban hotels and lodging. 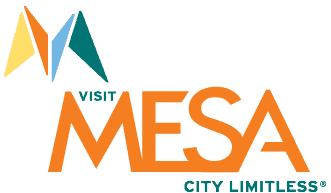 Mesa’s new Adventure Explorer Guide can help plan ways to make the most of desert spring days, especially the "Treasured Trails" section, which highlights 15 trails of varying difficulty from within the Mesa city limits, to the nearby Tonto National Forest, Four Peaks and Superstition Wilderness areas. Download the guide here and get ready to see a spectacular spring in bloom. You’ll never think of the desert the same way again. Ready to plan your outdoorsy Mesa getaway? Have you ever been to the desert? The kind where craggy buttes tower over escarpment terrain? Now, have you been after dark?